It’s wonderful when a business can provide benefits to the local community, outside of their core service. If you’re not familiar with Hawthorne Food and Drink, this Toronto restaurant offers locally-inspired cuisine and doubles as a social enterprise, providing first-class culinary training to those seeking employment in the hospitality industry. In fact, 80% of trainees have been successfully placed in jobs in Toronto’s hospitality industry. Torontonicity was recently invited to try their Spring 2018 menu overseen by new Executive Chef Donald Williams. 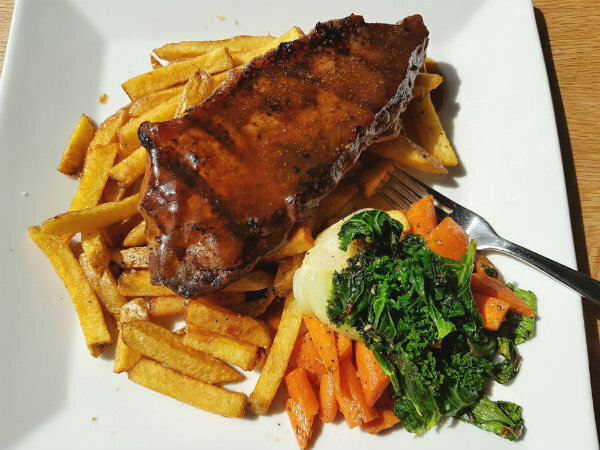 We visited the Richmond Street East restaurant on a recent Thursday for lunch. We were greeted quickly upon our arrival and seated at a sun-infused window table. Our friendly server quickly came over and informed us about the daily specials and the soup of the day and gave us a few minutes to peruse the menu. Hawthorne Food and Drink is on the ground floor of the Hospitality Workers Coop. 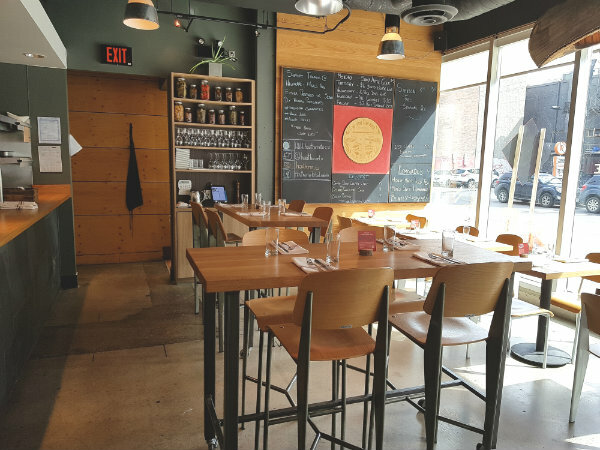 The restaurant is small, seating approximately 40 people, and features industrial décor including concrete floors and ceilings and low-hanging light fixtures. Light pours in from the southern-facing window, creating a larger looking spaceBecause Hawthorne Food and Drink uses local, seasonal and sustainable ingredients in their meals, their menus change frequently based on what is available at Ontario farms. My dining partner opted for the soup of the day, which was Squash and Potato Soup, $9 while I chose the Lambton Beets Salad, $16. For entrees, my dining partner ordered the Chicken Stir Fry with Maple Farms chicken, seasonal vegetables with Hoisin sauce and Jasmine rice, $12. I ordered the special of the day, which was an 8 oz. Ontario Wellington strip loin with seasonal vegetables and in-house, hand-cut fries, $30. While waiting for our appetizers, we enjoyed listening to a range of hits from 90s artists including Hootie & the Blowfish and Salt-n-Pepa. Our appetizers arrived within 10 minutes. 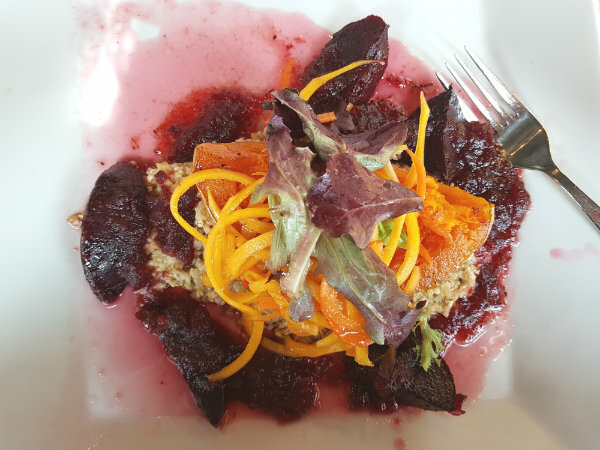 The soup was silky and flavourful while my Lambton Beets Salad was a revelation. The roasted beets were sweet while the baked squash was perfectly tender. The malted wheat berries tasted incredible – their nutty flavour perfectly complementing the sweetness of the vegetables. 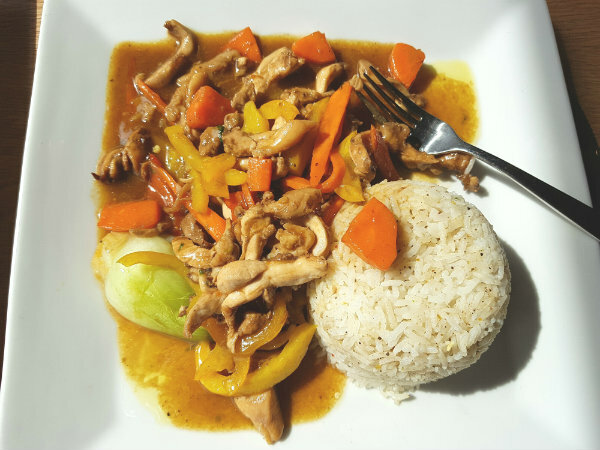 My dining partner’s Chicken Stir Fry featured sliced sautéed chicken with yellow peppers, carrots and kale in a delicious sauce that definitely tasted like a Thai curry, not a Hoisin sauce. The curry sauce gave off a medium amount of heat and was a perfect dipping sauce for the steamed rice. My striploin steak was cooked to my request of “medium” – the juicy meat was wonderfully enhanced by garlic and steak spices. There was an abundance of tasty, hand-cut fries adorning the plate, which I could not finish. Side vegetables of baked carrots were cooked al dente, if a little on the salty side while steamed baby bok choy was sweet and tender. My dining partner loved the Ontario Sour Cherry Cake, $8. The dessert was comprised of two pieces of a deliciously chewy cake punctuated by fresh cherries, sweet whipped cream and a delicious caramel sauce. Fresh blueberries and strawberries decorated the plate. 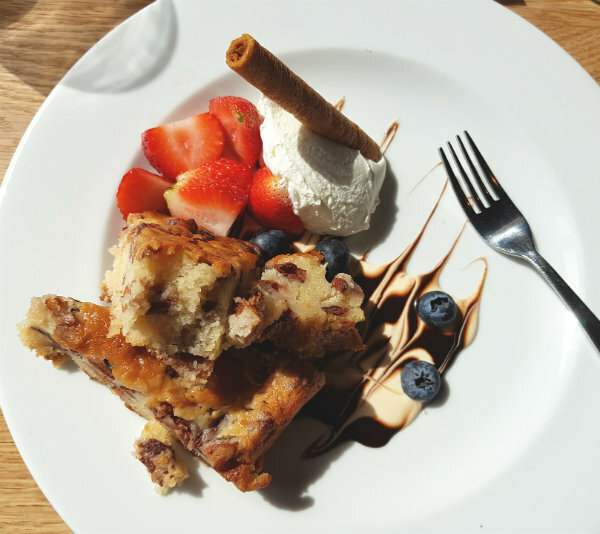 We were really impressed with the food at Hawthorne Food and Drink. Not only is this Toronto restaurant fulfilling a critical economic role, it is serving up first-class fare to those lucky visitors who pass through its doors. Stop in the next time you’re feeling hungry at Richmond and Yonge! Nice unique dishes! I think they are creative in this restaurant. Awesome looking dishes I know many people will enjoy.